This Vintage look Sport Luxe fountain pen could be considered a great tribute to the earlier Sport Models of more than 70 years ago, a design that has truly passed the test of time! 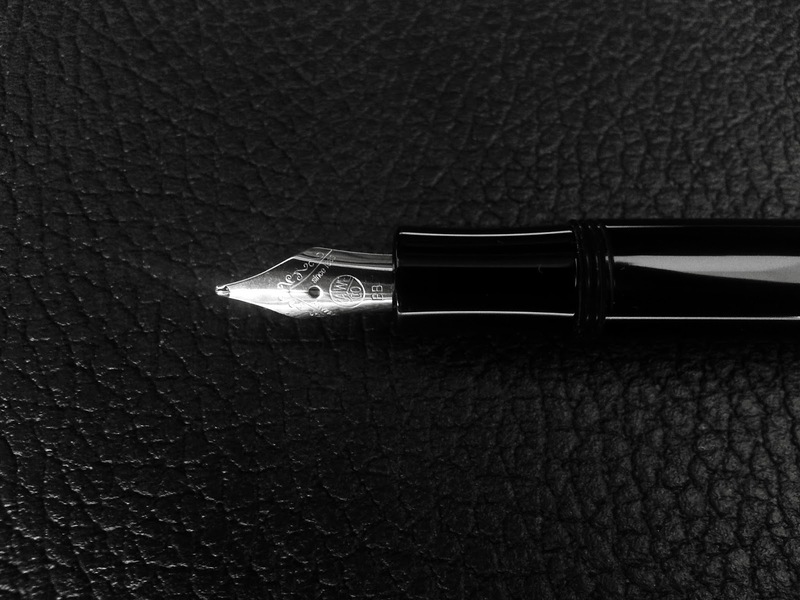 The deep black acrylic and gold-plated hardware give this pen it's beautiful vintage look. It's fun to see how these small details make this pen look completely different than the modern-style AL-Sport! As always, it comes packaged in a nice vintage-look tin! The Sport pens from Kaweco are known for their simple, yet elegant and intriguing design. They are small when capped, but long when you post the cap. Making it a great travelling companion. The design with the oversize cap is something you either love or hate, I perfonally love the form factor of this pen (which explains the fact that I have quite a few of them in my collection!). Even though this pen is entirely made out of acrylic (which is quite light), it still has a decent weight (don't expect a heavy pen though...). My guess is the integrated clip gives it that bit of extra weight. I prefer the weight of this one over the lighter ART Sport (which doesn't have that wheighted barrel), I think it suits me a bit better. The integrated clip also drastically impoves the functionality of this pen, making it much easier to carry it around in your shirt pocket! Plus it looks nice, it adds a bit of extra detail to the pen. Something I didn't like about this pen, and any acrylic pen in general really, is that the shiny surface is very, VERY prone to scratches and scuffmarks. It's virtually impossible to keep it in a scratchless condition, even when you are very carefully like me! The BB (double broad) nib is smooth, quite juicy, and it's a decent writer overall, like all other Kaweco nibs. But I wouldn't buy it myself. The line-width isn't very consistent, or at least not as consistent as I would like it to be. And I had some trouble with hard starts, it sometimes took a few tries to get the ink flow going. (Which might have been caused by this red ink, I'm not completely shure) Of course, as always, nibs are interchangeable, so it's not a huge deal. My personal advice would be to stick with finer nibs, like EF or F, or a Medium. But if you really like Broad nibs yourself, you might want to try it out anyway, it might suit you more than it did suit me! 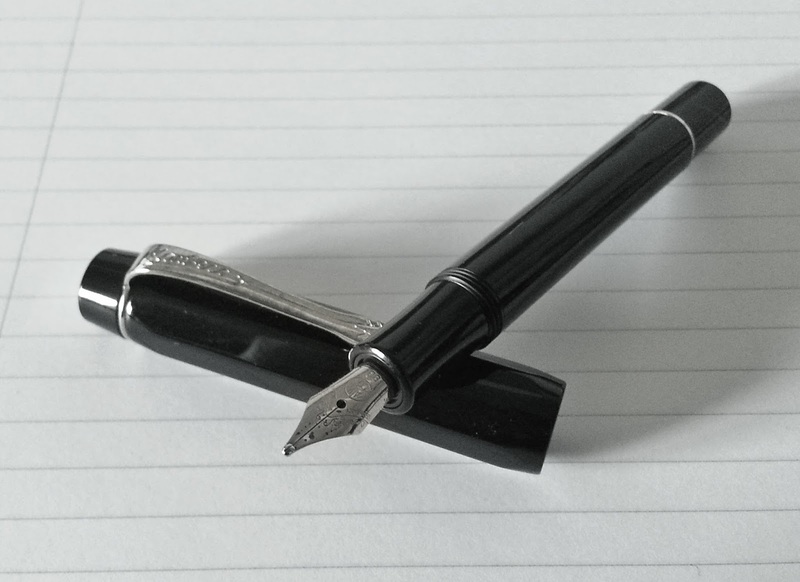 Overall, the Kaweco Luxe Sport is a great little pen, with a beautiful vintage-like appearance. The only real downside is probably it's price! As with the ART Sport (which is also made out of acrylic), it tends to sell for around 110 USDollars (Approximately 90 Euros). Which isn't a cheap price at all. But you do get a very nice pen for that kind of money! Note: this pen was sent to me by Kaweco, only to try it out and write this review. And I was in no way influenced in the making of this review, the opinions shared in this review is completely my own!. That's a nice looking fountain pen! I own a couple of the less expensive Kawecos and like them very much. I just cannot see the enough difference to justify the much higher price. It makes me want one, in fact I think it might be my next pen. I have both a regular sport and a kaweco student and the sport's plastic is just too cheap feeling for me despite being a great writer. The acrylic on the student makes it feel like a substantially more expensive pen. If you're interested here's my review of the sport http://kaffehauz.com/?p=64. Cheers. Thanks! The Luxe is in no way comparable to the classic sport. The acrylic makes it look and feel much better! The only downside might be the higher price, but if you like kaweco nibs and the design of the classic sport, you'll definitely love this one! PS: I read your blog, and I really like the combination of pens and photography (My two passions as well!)! I'll add it to my blogroll!